Soda-popped lo-cal malt beverage sabotaged by artificial lemon-limed flavoring and cloying corn syrup pasting. Combine a salted Margarita with 7-Up and ginger ale, then mix in washed-out strawberry and watermelon nuances and serve as soapy light lagered ‘malternative’ to wine cooler fems. Disgustingly cloy and artificially colored green-hued malt beverage tastes like perfunctory ginger ale or drab malt liquor. Glutenous gummy sugaring, slick lime soda reminder and lemon-candied barley malting reduced to nasty carbolic astingency. Stink…stank…stunk. Trash. Nasty straw-paled lemon-juiced malt liquor gets disgustingly cloy. Herbal honeyed lemon-limed sugaring picks up camphor-oiled eucalyptus and Hall’s mentholyptus illusions. Iodine-like astringency hampers ginger spicing. 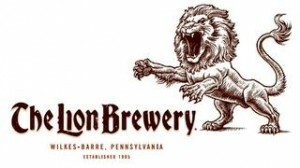 Way worse than Mike’s Hard Lemonade. Pale bodied energy drink with ginseng and guarana extract pronounced ‘b to the e power’ (or beer energy) competes with Red Bull since its horridly cloying malt liquor appeal poses as preposterous malternative. Tropical guava-pineapple-mango charade and strawberry-raspberry waft upset by sticky soda mouthfeel. Yuck! Unassumingly heady pink-paled ruby-hued 10% alcohol ‘malt beverage’ ineffectively combines black raspberry with blueberry puree. Result: bitter blueberry-cranberry-boysenberry undercurrent nips at overripe blueberry-raspberry sweetness, causing negative vinous phenol souring to dislodge fruity frontage. 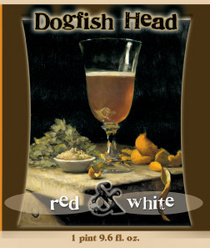 Ultimately lacks overall depth, complexity, and resilience of brewer’s exquisite Red & White. Closer to a heavy porter and just a tad coarse (though never astringently so), this 12% alcohol-strengthened brown ale disguises its heady ambitions well. 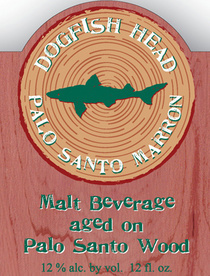 Brewed inside Palo Santo wood, the dry-bodied cola-hued ‘malt beverage’ invites thickened brown-sugared black chocolate malting, maple-sapped molasses-cocoa influence, and oaken vanilla tinge to port-brandy wining. Charcoal-stained bitter end picks up black cherry sweetness and minor grape-date-fig souring. Imaginative soft-watered pinkish amber 10% alcohol ‘malt beverage’ made with pinot noir juice and Belgian yeast, then aged in oak barrels, keeps revealing sundry complexities. Strangely, advertised coriander and orange peel components are well hidden, working as conduits for chewy honeyed malt-stricken sherry, bourbon, and brandy illusions as well as cane-sugared cherry jubilee, honeydew, cantaloupe, and mango fruiting. 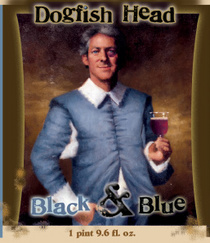 Studies prove mixing wine and beer is dangerous, but Dogfish puts ‘em together in one bottle. Bavarian beer-lemonade mix undeniably leans closer to the latter as spring water freshness, honeyed ginger ale flow, and juicy lemon tang get fizzy-hopped spritz. Grassy hay and leathery horsehide dryness drape lemon-candied sourness. Serve as mild summer afternoon indulgence. Traditional lager heads need not apply. Fine alternative for lame Zima-Tequiza crowd. Dismal cloying honey-sugared nature overbearing but lemon thrust has its sweet charm. Like a fruity soda, its trite sucrose candy-coated glut gets old fast. Pungent pinkish-paled short-headed raspberry brew with sweet candy scent and syrupy fructose flow is fair alternative to wine coolers. However, closer to strong soda than beer or malt liquor. Slick, sticky, and ultimately cloy. 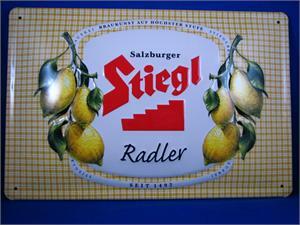 Cloying whitish-paled light pils given soda treatment for boisterously juicy sugared lemon sweetness that gets sticky, then slick. Honeyed lemongrass relief lathers dry hay-leathered sub-texture.